The Ford SVT Cobra Mustang was a very special limited edition pony car, celebrating the last year of the fox body cars. Flexing it's performance engineering muscles, the Ford Special Vehicles Team, which was created in 1991, were ready to show what some concerted performance work on the famous Ford Mustang could produce. If you were one of the showroom super car's 5,100 lucky owners, you were in for a treat! The 1993 Mustang SVT Cobra's specially prepared 5.0 liter V8 kicked up 235 horsepower and 280 pounds of torque. While that was only 10 more horsepower (or 30 hp: see note below) than the 5.0 Mustang GT, the total package wrapped around it created a synergy. A whole, that was more than just the sum of the parts that made it. Note: You'll notice that in some reports, that the 1993 Mustang GT was down-rated to 205 horsepower, which Ford reported as some kind of a change in it's engine dynomometer measurements. Even with the significant upgrades to performance and handling, the sum total of the parts seemed to be not quite enough for the folks at the Special Vehicles team, who promptly created a special "Cobra R" model. Whether that R stood for race, or red (Ford Vibrant Red) really makes no difference. What does matter, however was that this limited production Ford SVT Cobra Mustang (only 107 units) added some special extras, such as 13.5 inch front discs and 11" rears, chassis and strut tower stiffening braces, special adjustable Koni shocks, different springs and roll bars. They also removed a few things to reduce weight, including the air conditioning, radio, the rear seat and all sound deadening materials. To keep things cool under the heat of battle (ie racing) Ford added a power steering cooler, external oil cooler and aluminum radiator. With a traction lock differential and running through a T5 transmission, the R version of the Ford SVT Cobra Mustang could pull off a quarter mile in the high 13's to low 14 seconds. Here's more on the 1993 Mustang and 1993 SVT Cobra. As you've no doubt noticed, Ford didn't just make the SVT Cobra Mustang a one year wonder. And came back with an updated offering for 1994 based on the new SN-95 platform. It was also included in the reintroduction of the availability of the Mustang convertible. Production increased slightly as well to 250 units, including one new and popular addition, the availability of more than one color! With the addition of bigger brakes, and more GT-40 goodies, the new SVT mustang Cobra handled better and sported a slight increase in power, up to 240 horsepower. Perhaps due to the major changes in the platform and the huge engineering project (and a whole lot of money) to create the new SN-95 Mustang, there was no Mustang Cobra R for the 1994 Mustang model year. For 1995, there were some surprises in store for the Ford SVT Cobra Mustang, including a new engine. 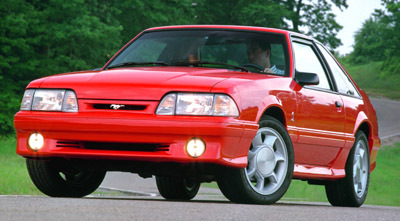 For full details, check out the 1995 Mustang section. The 1996 model year also held new surprises, such as an SVT version of the completely new 4.6 liter modular V8. The biggest surprise, was probably the fact that tis new engine was capable of pumping out as much horsepower as the Cobra R of only the year before. Ford debuted the "Mystic Cobra", which featured a chameleon like paint that took on the look of several different colors, depending on the light, angle and time of day. More on the Mystic Cobra can be found in the 1996 Ford Mustang section. Very little was changed to the fire breathing 305 horsepower SVT Mustang for 1997. Styling remained virtually unchanged and with a 3.27:1 traction lock differential and the beefier Borg Warner T45 five speed, the 3,400 lb coupe was able to post mid 5 second runs from 0-60 mph. More details and specifications can be found in the 1997 Mustang section. 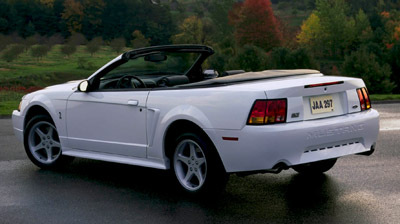 The 1998 SVT Mustang Cobra was again made available in both convertible and coupe versions. Performance remained stellar for the time with a 0-60 of only 5.9 seconds and a quarter mile in the high 13 second territory. Top speed was rated at a cool 152 mph (at a race track of course). 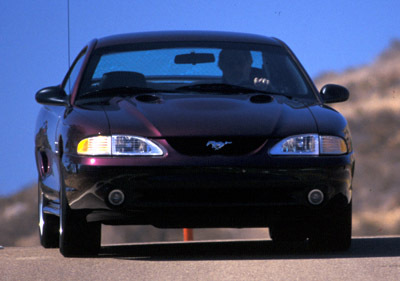 For more details, check out the 1998 Mustang section. With the start of the 1999 Mustang model year, came the next generation facelift and the 1999 Ford SVT Cobra Mustang was no exception. Power in the specially prepared 4.6 liter modular engine was up significantly, as as you'd expect, so was overall performance. Full details can be found in the 1999 Mustang Cobra section. The 2000 Mustang featured just one version of the Cobra package, the return of the famed Cobra R. With a completely new and larger than life restyling, there was no question that this new model was a performance car that was not to be taken lightly. More details on the 2000 Cobra R can be found along with the 2000 Mustang. After a one year hiatus, the standard version of the SVT Cobra was back and included a 320 horsepower 4.6 liter V8, Tremec 5 speed and a redline at a soaring 6,800 rpm. This high small block upper end rev limit was no doubt the result of the Cobra's dual overhead cam cylinder heads, which significantly improved the much criticized 4.6 liter V8's inherent breathing problems. Here's more 2001 Ford SVT Cobra Mustang information. If you're wondering where the 2000 SVT Cobra went, then you're not alone. In fact, for most of us, there wasn't one. A grand total of 100 SVT Cobra Mustangs were converted to right hand drive and shipped to Australia. Now that's a rare Mustang ! The 2003 Ford SVT Cobra Mustang version was code named "the terminator". Having pretty much wrung out every ounce of performance in the naturally aspirated 4.6 liter V8, the folks at the Special Vehicles Team decided that force feeding was the only way this baby was going to get big horsepower. So, thanks to the addition of an Eaton supercharger, these beasts upped the horsepower ante in a major way. For the full story and specs, check out the 2003 Mustang Cobra section. The 2004 model was for the most part a very powerful carryover of the 2003 SVT package, with identical horsepower and performance specs. No doubt, this had much to do with the upcoming completely new 2005 Ford Mustang, which was slated to look much like the retro styled concept car. Here's more detailed information on the 2003 Mustang SVT Cobra. Although you'll no longer see a specific Ford SVT Cobra Mustang available as of the 2005 model year, the Special vehicles team haven't exactly been on vacation. Teaming up with Carrol Shelby, you'll see the SVT logo figuring prominently in the new Shelby Cobra Mustangs. (Some say that's where the name should have been all along). Shelby, however, while all in for supercharging that ole Ford motor, isn't one for using the same innards that any old Mustang runs. No sir, this is Texas, and here, ya just gotta go BIG ! And that he has. Bigger engine, bigger horsepower for an even larger than life Shelby SVT experience.